Ginger Snaps’ single Number Crunching has been nominated in the Best Produced Record category of this year’s Unsigned Music Awards. The news comes days after the group released their latest single The Modern Man. Held in partnership with Live Nation, the UMAs head to The Brighton Centre on May 16 and will at as the opening ceremony for The Great Escape Festival. Nominees and winners are voted for by a panel of more than 100 music industry tastemakers, professionals and executives including people from record labels, publishers, live agents and major online editors. Number Crunching is up against Why I Try by Jalen N’Gonda, Animal by Strong Asian Mothers, Mirrors by Cattle & Cane and The Dancefloor Suit by Le Flex. Simon O’Kelly, CEO of UMA Music Group and the Unsigned Music Award said: “We are excited to continue the growth of the Unsigned Music Awards as a platform to promote unsigned, self-signed and otherwise emerging artists, around the world. Fronted by Jay Brook, the eclectic Northampton act combine infections guitar hooks, hip-hop beats and huge pop choruses. Ginger Snap’s fifth latest single, The Modern Man was released at the end of last month and sees the band continuing its flair for off kilter indie pop with an amalgamation of sounds inspired by a brain racked by Beastie Boys, Beck & De La Soul. Co-produced with Dan Gatreau, horns and brass are woven with scratching from DJ and collaborator J Science. 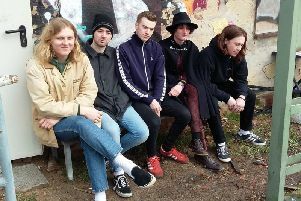 Championed by the likes of BBC Radio One and 6 Music, Radio X, Virgin and Absolute radio stations, Ginger Snaps have also received support from the likes of Clash, DIY and Dork magazines. An EP is due out later this year. Ginger Snaps kick off their tour on Tuesday, April 24, in Glasgow and will play a ‘secret show’ in Northampton on Sunday, April 29. The tour also includes gigs at Liverpool’s Sound City and Newcastle’s Hit The North festivals.